I was very interested to read the article (RECORD 9) dealing with the present position on the Longmoor Military Railway. In addition to the references to previous publications given, you will find a very good account of the line in the August 1933 "Railway Magazine" including some good photographs. There was also a post-war account in the "Railway Gazette" for 5th July 1946. I was stationed at Longmoor from August 1947 until my departure to the Detmold Military Railway in Germany in April 1948. 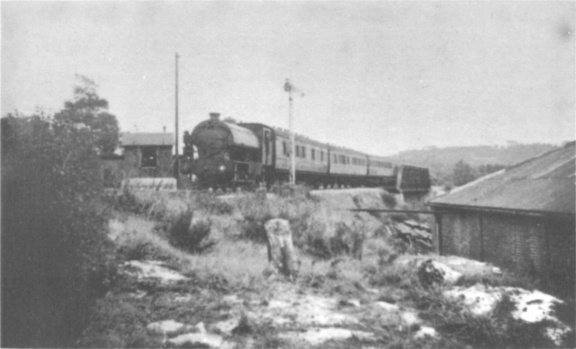 At this time the line was worked mainly by standard Austerity saddle tanks, but several of the pre−war locomotives were still stored ("hidden" would be a more accurate description) in various odd sidings around the system. The whole time I was there I kept finding locomotives not seen before. Your readers may find a list of these of interest. 70204 SELBOURNE 0−6−0T Hawthorn Leslie 3531 of 1922. I believe that this locomotive left Longmoor during the period I was there. (it may have just moved to a fresh hiding place). 70205 GORDON 0−6−2T ex Taff Vale Railway 28. This was retrieved from its hiding place on 16th October 1947 to be prepared for dispatch to a purchaser. Designed by John H. Adams. Built at Stoke Works 1909 for North Staffordshire Railway. Classified New L No.158. Taken over by LMSR 1923. Purchased by W.D. 1936. 70208 KITCHENER 0−6−2T Bagnall 2587. 70228 DAISY 0−6−0ST Peckett 1204 of 1910. I found this one at the very end of my stay at Longmoor as it was very well hidden amongst rows of derelict wagons in Gipsy Hollow yard. It was painted a light blue in contrast to the dark green of all the others. 72400 EARL ROBERTS 4−4−2T ex Southern Railway 2013. 72401 4−4−2T ex Southern Railway 2019. 70177, 70179, 70195, 70198. 0−6−0 ex G.W.R. "2301" class. All fitted with Westinghouse air brakes. 70177 fitted for oil burning. None fitted with pannier tanks, but the tanks from 70179, 70195, 70197 and one other (number unknown) were lying in Gipsy Hollow Yard. This completes the list of stored locomotives except for about twenty-five Austerity 2−10−0’s which appeared to have been there since delivery from the makers; at any rate they had done very little work. These started to leave in batches of three or four at a time about the beginning of 1948, going to Eastleigh or Brighton Works. 79250 MAJOR GENERAL McMULLEN 2−8−0 Vulcan Foundry 5193 of 1945. The "showpiece" locomotive, it was painted dark blue, lined with red and gold, and kept in spotless condition. Seldom used except on special occasions, it resided in the diesel shed with all parts labelled as an instruction engine. At one time was fitted with an electric headlight but did not carry this while I was there. 77337 Austerity 2−8−0 known to all as "LA DELIVERANCE" from the shed code painted on the cab side while the engine served in France during the War. 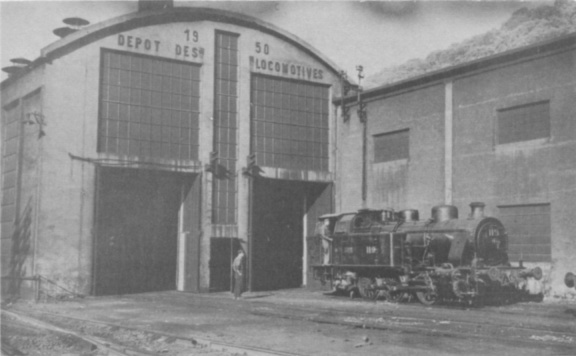 (Nearly all the 2−8−0’s returned after the War still carried the French shed allocation on the cab sides.) This locomotive was usually used if something larger than a saddle tank was required. 73797 2−10−0 North British 25643 of 1945 was seldom used while I was there. 94382 MAJOR GENERAL FRANK S. ROSS. 0−6−0T Davenport 2531 of 1943. Ex U.S. Army T.C. Painted dark blue lined red and gold. Often used. That completes the steam locomotives but the diesels were quite an interesting bunch. 70043 0−4−0D Barclay 358 of 1941 painted khaki. 70216 0−6−0DE Armstrong Whitworth D 58 of 1935 painted black. Used on the passenger service during leave periods when most of the camp was on leave and only a skeleton service run. 70271 and 70272 0−6−0DE built L.M.S. Derby 1945. Painted brown. 70238 0−4−0D John Fowler 22976 of 1942 painted khaki. 71232 and 71233 Bo-BoDE. These locomotives carried Baldwin 1941 plates and arrived just before I left, looking a very sorry sight. They had been savagely attacked with gas cutting torches to make them clear the English loading gauge for the journey from Southport to Longmoor. 72214 0−4−0D Ruston Hornsby 224345. Painted brown. 72220 0−4−0D Drewry Car Co. Painted khaki. The roster was completed by the two 4−wheel railcars, known as the "Wickham car" and the "Drewry car". The coaching stock included an ornate 6−wheel observation inspection car and some ex Caledonian Railway 12−wheelers. Before closing though I must mention 3239, the Hunslet 4−6−0T, which carried a plate stating "Built at Hunslet Leeds 1919. W.D. Indent No.1832. Boiler No.4530." This locomotive was out in the open with several other pieces of instructional equipment, mounted a couple of feet off the ground and supported by concrete blocks under each buffer beam. The system of naming all the locomotives was about to be introduced just before I left Longmoor in April 1948. I remember seeing a memo listing the proposed names but do not have a record of it. There were many more shunting yards around the system at that time (and most were regularly used) than shown on your map on page 200. Starting at Bordon, there was a double track as far as Oakhanger but only one track was the main line and this was worked as single with staff instruments. 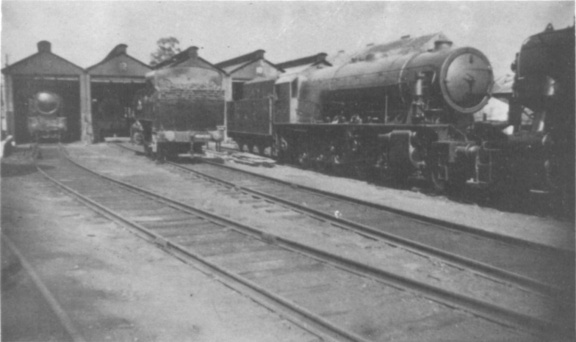 The other connected Bordon yard with Martinique yard which was alongside Oakhanger station. This was taken by the Martinique shunt when going to Bordon to avoid using the main line. The spur going off to the right of Oakhanger on your map used to go down to Louisberg coal sidings, as they were then known. Between Oakhanger and Whitehill were three sets of sidings; one was known as Montreal but the names of the other two escape me now. One is shown on your map as Bordon Camp but I believe this was known by another name while I was there. Halfway between Weaversdown and Liss Forest Road was Palmers Ball Yard. I am not too well acquainted with the Hollywater loop as I never managed to circumnavigate it completely. But between Hopkins Bridge and Whitehill was Hopkins Sidings, while Hopkins Bridge itself was a large "Everall" sectional truss bridge built across a slight depression in the ground for training purposes. Most trainees had "a go" at it but I don’t know if it was ever completed as they only did a little at a time and often dismantled it again afterwards. If completed the span would have been about 320ft. The main line would have gone across it if complete but in my time it went around the side as described in your article, so it sounds as though they never managed to get it finished. At the other end of the loop, between Longmoor Downs and Griggs Green there were sidings alongside the main line known as Heifers Down where the Austerity 2−10−0’s were stored. Parallel to these sidings on the other (south) side of the Liphook road was Gipsy Hollow yard, a very extensive maze of sidings where most of the old locomotives were stored. I believe that parts of this yard had other names but I cannot remember now. At the period of which I write there was an intensive service daily, both passenger and freight, which required about six engines in steam. The passenger timetable included a late night train from Bordon (SO) which was timed at one intermediate blockpost at midnight, and I was intrigued to see it listed in the timetable as 00.00 hrs. I enjoyed this article in RECORD 9, and enclose a photograph of GORDON, one of the old Longmoor engines, obtained shortly before it was taken out of service at South Hetton Colliery in County Durham. On the original print slight steaming can be seen on top of the boiler (the photograph was taken about 8p.m. on a wet evening) and the reflected light comes from one of the yard lamps beside the line. The most peculiar wear of the wheel bosses caused by forcing too long a wheelbase round too tight curves in the colliery sidings was very noticeable. I did suggest removing one pair of side rods but was told that all the coupled adhesion possible was required to surmount the heavy gradient up from the Murton direction. GORDON’S history I think is worth recording. Built at the Taff Vale Railway West Yard Shops, Cardiff, in 1897 (works No.306) to the design of Hurry Riches; T.V.R. 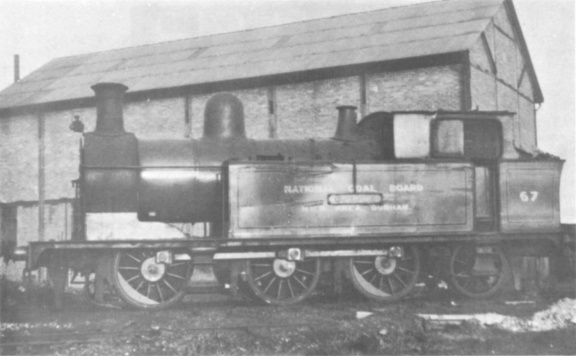 No.28, Class 01. Became GWR 450 at grouping, and fitted with Swindon trumpet-type safety valve casing; withdrawn in October 1926 and sold to the War Department at Longmoor in December 1927, No.70205. Went to South Hetton Colliery in February 1948.
designing and building of totally Welsh origin.